Fried pasta with egg is one of my favorite things to eat when I’m dining alone, and it was just what I needed to help me feel a little less blue. I promise to try a little harder once I’ve got the fridge and pantry re-stocked this weekend. Looks like you made lemonade! I don’t know about trying harder, that looks great! I always like using my “single” dining nights on foods my S.O. doesn’t particularly enjoy. Wishing you the best! I agree with Christine. The nights I eat alone are the best nights for experimentation. And the occasional bowl of cereal. 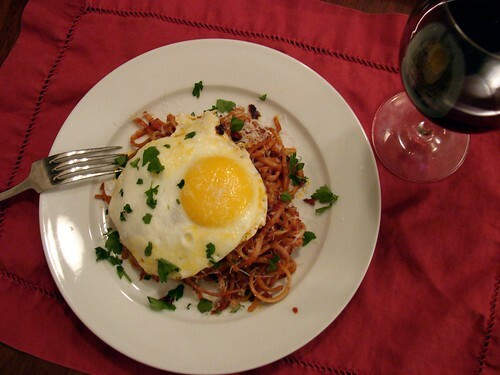 egg and pasta and wine and amazing! I like the ‘whisper’…very nice. I also like dinners for me. Somehow blissfully self indulgent, no matter what the menu. I’m a huge fan of cooking for oneself when cooking on my own and indulging in things I otherwise wouldn’t eat if with the husband. I love this dish–I’m not big on fried eggs and I would add a poached egg instead–but it’s all about easing into a transition. Maybe it’s not ideal to the high standards you set for yourself, but it looks phenomenal all the same! I’m dining alone tonight…I think I will give this a try. That is some serious comfort food.